Mid Penn Bancorp, Inc. is the holding company for Mid Penn Bank with locations throughout Central Pennsylvania. Headquartered in Millersburg, Pennsylvania, Mid Penn is committed to serving the community with retail offices in Berks, Bucks, Chester, Cumberland, Dauphin, Fayette, Lancaster, Luzerne, Montgomery, Northumberland, Schuylkill and Westmoreland Counties. Mid Penn continues to build a strong reputation as a partner to area businesses through commercial loans, SBA loans, cash management services and lines of credit. Mid Penn is also committed to providing the community with the best in personal banking, including checking and savings accounts, mortgages, home equity loans and lines of credit and trust and wealth management services. With a local board of directors and locally based employees, Mid Penn has been named one of the "Best Places to Work in Pennsylvania". 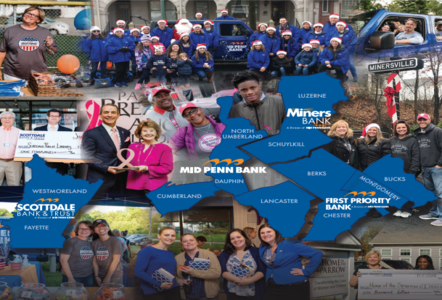 Mid Penn has also been recognized on American Banker magazine's "Top 200 Community Banks" and "Best Banks to Work For" lists. Mid Penn Bank is a recipient of the "Grow Your Community Award" from the Pennsylvania Association of Community Bankers. Common stock of Mid Penn Bancorp, Inc. is publicly traded on NASDAQ under the symbol "MPB".